An obscured, haggard woman wearing a tawdry, ornate dress walks through the cold and desolate early morning streets, reuniting with other prostitutes to warm themselves by an open campfire before returning home. A casual remark reveals that the aging prostitute had once served at the Imperial Court, but the enigmatic and reticent Oharu (Kinuyo Tanaka) summarily declines the opportunity to recount the hapless circumstances that led to her sordid commerce. Instead, drawn to a passing monk’s solemn morning ritual, Oharu wanders into a temple, and encounters a statue of Buddha that bears a striking resemblance to her lost true love, Katsunosuke (Toshirô Mifune). An extended flashback sequence reveals the scandalous affair with the young and impulsive lower ranking page – the initial catalyst in a series of interconnected, fateful events that Oharu would euphemistically describe as “incidents” that inevitably define her lost life. Adapted from the Tokugawa shogunate-era novel, Life of an Amorous Woman (Koshoku ichidai onna) by Saikaku Ihara (1686), The Life of Oharu reflects the injustice and repressive legacy inherent in the governance of the Tokugawa regime’s strict bounds of conduct and social class. By chronicling Oharu’s consequential social descent from a prominent lady of the court to concubine of a Tokugawa clan relative, Lord Matsudaira (Toshiaki Konoe), to indentured courtesan, to adopted servant, to disinherited widow, and eventually, to common street prostitute, Mizoguchi underscores the hypocrisy of coercive laws that foster class stratification, exploitation, and marginalization under the anesthetized rationalization of upholding moral codes and centralizing authority. The literal translation of the film’s title, Life of a Woman by Saikaku, further alludes to the vestigial legacy of the hierarchical society that relegates women to an anonymous life of perpetual subservience. However, in contrast to the unnamed, wanton ‘amorous’ woman of the Saikaku novel, the protagonist of the film is immediately identified as Oharu (the first line of dialogue spoken in the film), and inferences of her disreputable conduct are refuted at each increasingly abject station. In diverging from Saikaku’s novel, Mizoguchi seeks, not only to validate the contemporary relevance of the Edo-period author’s criticism against the culturally entrenched class structure of Japan, but more importantly, to identify with and expose the plight of women under a repressive patriarchal society. From this perspective, Oharu’s irredeemable downfall may be seen as a series of selfish and reckless transactions between irresponsible (and often weak) men: Lord Matsudaira’s dispatch of an emissary to find a physically ideal surrogate to bear an heir, Oharu’s father, Shinzaemon’s (Ichirô Sugai) sale of his own daughter to a Shimabara courtesan house in order to pay for his speculative, accrued debts (a desperate act that alludes to a similar episode in Mizoguchi’s own traumatic childhood), her fall into disfavor at Shimabara for refusing a crass, money-obsessed client, the dissolution of the couple’s modest fan shop after her husband Yakichi’s (Jukichi Uno) unexpected death. In essence, Oharu’s adversity is shown, not as a consequence of a youthful indiscretion, but as a chronicle of the endemic commodification and objectification of women in a society where identity, privilege and the retention of power are achieved through the conventionally masculine attributes of aggression and virility. In the essay, “Why Does Oharu Faint? 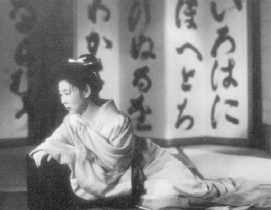 Mizoguchi’s The Life of Oharu and Patriarchal Discourse,” Robert N. Cohen proposes that the exquisite final shot of the film is not a reflection of Oharu’s spiritual transcendence, but rather, a pyhrric victory that is attained only after the heroine (perhaps subconsciously) abandons her gender identity and sexuality. (1) However, if Oharu’s travails are viewed solely as a linear process of systematic de-sexualization, then how does one reconcile the seeming incongruity of the film’s circular structure and imagery? The early morning scene in the Buddhist temple that triggers Oharu’s memory is resumed at the end of the flashback, and is further interconnected to episodes of monastic encounters in her former life (after Yakichi’s death) and her eventual destiny (It is interesting to note that Oharu’s spiritual reconnections structurally form the infinity symbol – 8 – in the film’s narrative). Moreover, the birth of Lord Matsudaira’s heir parallels her own rebirth from mother to child – in her redemption from Shimabara that enables her to return home, and in her adoption to the merchant, Kahei (Eitarô Shindô). By characterizing Oharu’s plight through figuratively circular spiritual intersections, Mizoguchi traces the resilient heroine’s inexorable path to transcendence. Filmed under the austerity of a seemingly insurmountable national recovery, The Life of Oharu reflects the crisis of conscience of the apure, the country’s post-war generation (from the French word après or ‘after’) – a somber and critical re-evaluation of personal and national accountability for the tragedy of the Pacific War. While subsequent post-war films such as Kon Ichikawa’s The Harp of Burma (1956) and Fires on the Plain (1959), Keisuke Kinoshita’s A Japanese Tragedy (1953) and Twenty-Four Eyes (1954), and Masaki Kobayashi’s The Human Condition trilogy (1959-1961) depicted the inhumanity and aftermath of war directly through socially relevant contemporary dramas, Mizoguchi reverted to the objective formalization of jidai-geki (period) film in order to examine its root cause and attempt to come to terms with its irreconcilable senselessness. In the end, the ‘feminist’ Mizoguchi finds redemptive meaning among the marginalized, perennial witnesses to the destructive transactions of men – the long suffering, selfless, indomitable, ideal woman.